These tools are indispensable for all persons working as security guards, whether at government departments or in industrial companies like power plants, metal- or chemical factories etc. In order to avoid that they are seriously injured or even die when doing their job or by being attacked by demonstrators, terrorists or other crowds ready to use violence, they must be equipped with adequate defence devices. However, it is necessary to practise the application of these special tools. With our special training courses we can provide each user with the necessary knowledge to use our equipment correctly and to avoid injuries. Unlike the tools of many other suppliers the PKI 9750 includes a wide range of features, i.e. baton, torch light and tear gas in one tool. 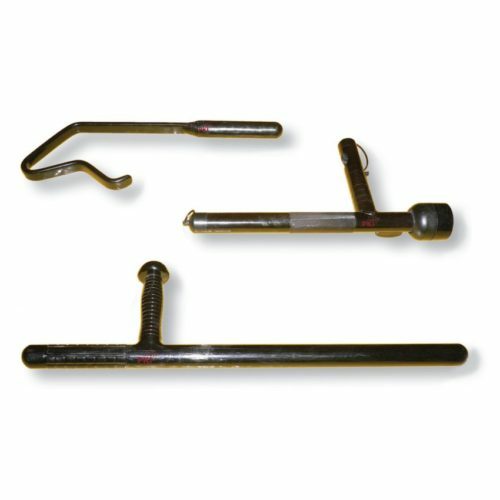 Optionally tools with bent hooks for capturing a person or tools with a grip and long lance to keep the aggressor at a safe distance are also available.